World fairs were designed to show the best in human achievements. Major exhibitions of arts, business, agriculture, humanities, cultures and customs were highlighted in large cities. The study of these intriguing events is a topic onto itself. 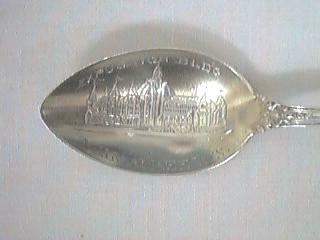 Many beautiful souvenir spoons were designed for some of these magnificent events. The Chicago world fair was precedent setting. It established a pattern for all future world fairs and contributed immeasurably to the future direction of this country and the world. You will be surprised by the number of things which we take for granted today that were first highlighted by this world fair. 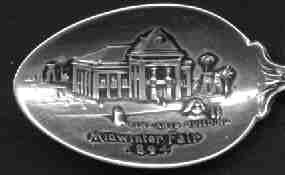 The 1893 Columbian World Fair in Chicago was one of the major impetuses for the collecting of silver souvenir spoons. In 1892, the fantastic "great white city" opened amid economic devastation in an economy that was described as a "monetary panic". Yet it is estimated that more varieties of souvenir spoons were created for this fair than for any other single event in history. Because so many spoons were created for this world fair, I have created a separate series of exhibition spoons. 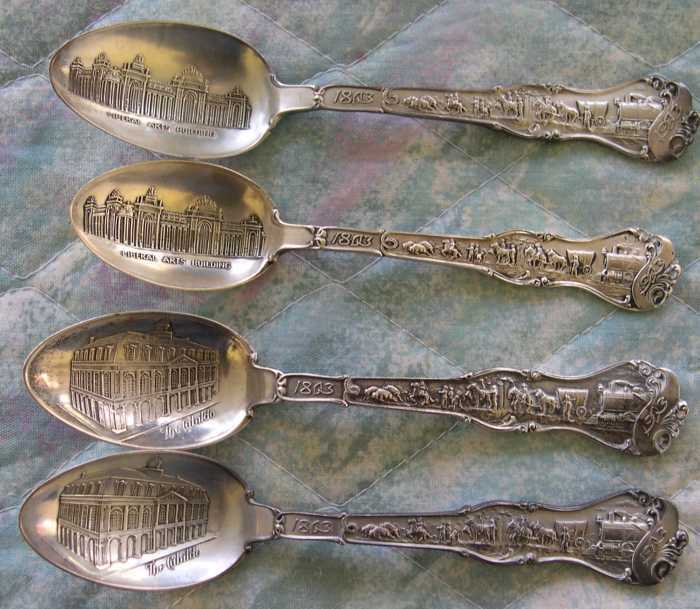 A number of other major expositions and more localized fairs were held and souvenir spoons were created for each of these events. The pieces shown here are not meant to be exhaustive, but merely to show some of the tremendous variety of spoons that are available to spoon and exposition collectors. The Cotton States Exposition was a little expo held in Atlanta in 1896. There are very few spoons from this expo. These are the "Official Louisiana Purchase Expo Spoons". 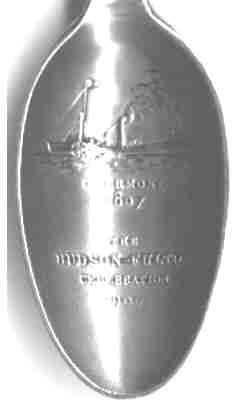 So many varieties of spoons were made for the Columbus expo that the organizers tried to monopolize the production of this souvenir. As we shall see--they were not successful. 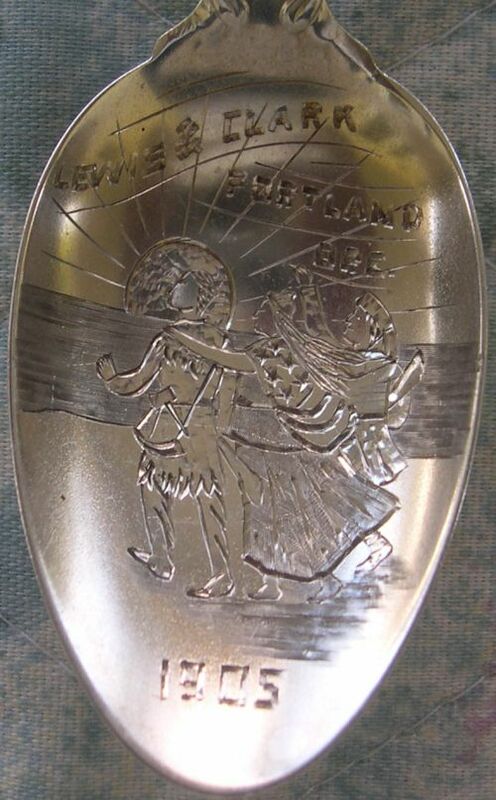 Note that these spoons have almost the same handle design (1803-buffalo hunter-covered wagon and campfires, train- 1903). The "Lewis and Clark" expo in Portland, Oregon in 1904/ 1905 was to celebrate the achievement of these western pioneers. A number of different spoons were created for this fair. The one pictured here is made out of copper (even though it is clearly marked sterling). The Front shows portraits of Lewis and Clark, a monument to them and the Oltnomah Falls and the back has various symbols for the home city of Portland. 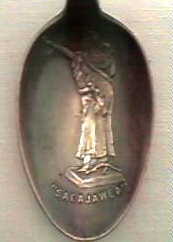 The bowl shows a statue of Sacajawea, the Indian maiden who guided the exploration party including the baby which she bore on the trip. Note: the new U.S. Sacajawea (Sacagawea) golden dollar is based upon this Indian guide. On the left the spoon is marked "world fair 1904"
The Alaska Yukon Purchase Exhibition of Seattle, Washington 1909 produced a number of very interesting spoons. A separate exhibit has been set up to show these and other gold spoons from Alaska. Click here to see the AYPE exhibit spoons. Some of these spoons may be later restrikes. In September 1609, Henry Hudson explored the great river which was later called the Hudson River. In his ship called the “Half Moon,” he entered New York Harbor on September 3rd and then sailed up river, recording his impressions of his journey in his log book. “On that side of the river called Manna-hata,” said Hudson, “we saw no people to trouble us and we rode quietly all night.” In August 1807, the inventor Robert Fulton traveled up the Hudson River at a speed of five mile per hour in his steamboat, the Clermont; within days of this historic journey, Fulton initiated regular steamship service on the Hudson River. In September-October 1909, the Hudson-Fulton Celebration was celebrated in New York City and on the Hudson River with parades, exhibits and re-enactments of the earlier voyages in New York Harbor and on the Hudson River. Thousands participated in this extravaganza which lasted for more than two weeks. This image is from the Metropolitan Museum of Art. 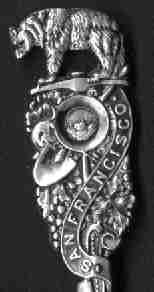 The 1915 San Francisco-Panama Canal exposition was a major exposition to honor the opening of the Panama Canal and celebrate the "riches" of California. 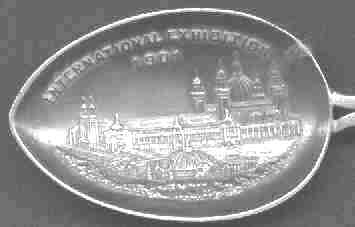 A variety of spoons are available from this magnificent exposition and the similar (but smaller) San Diego exposition. The spoons for this fair have been expanded and combined with Panama Canal spoons and placed in a separate exhibit. Click the links to see these beautiful and interesting spoons. 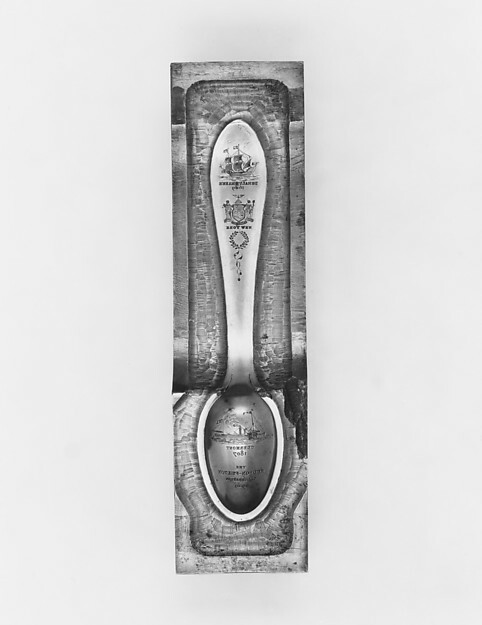 Silver plated spoon by Roger Bros.
Chicago "a Century of Progress"
In the depths of the Great Depression, Chicago tried to recreate the great success of the earlier Columbian World Fair of 1893. They were not entirely successful, but were able to stage a presentable world fair. This "futuristic" Fair opened in New York City just prior to the beginning of World War ll. The spoons shown here are the Official spoons for the Seattle World's Fair and were patented in 1961. The vermeil bowl is engraved "World Fair Seattle 1962" The totem pole handle is from an old die ca. 1900. The quality of the enamel work is not nearly as good as it should be. This silver plated demi is the only souvenir spoon from this fair of which I am aware. Some cities built exposition buildings to attract smaller trade shows. Sometimes these buildings were of significant interest to justify the production of a few spoons. These are usually hand engraved in small lots. 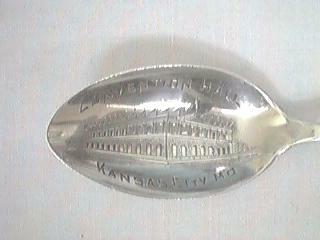 Kansas city spoons are readily available. In 1876 the Centennial Exhibition was held in Philadelphia. 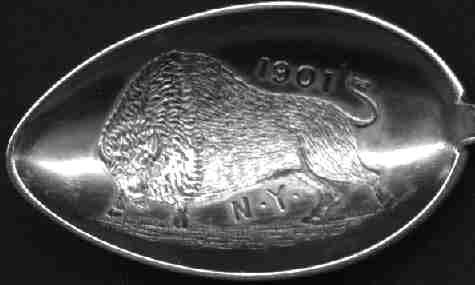 This was fifteen years before the start of the Souvenir Spoon Movement in the United States and at the very inception of the Art Nuevo period. 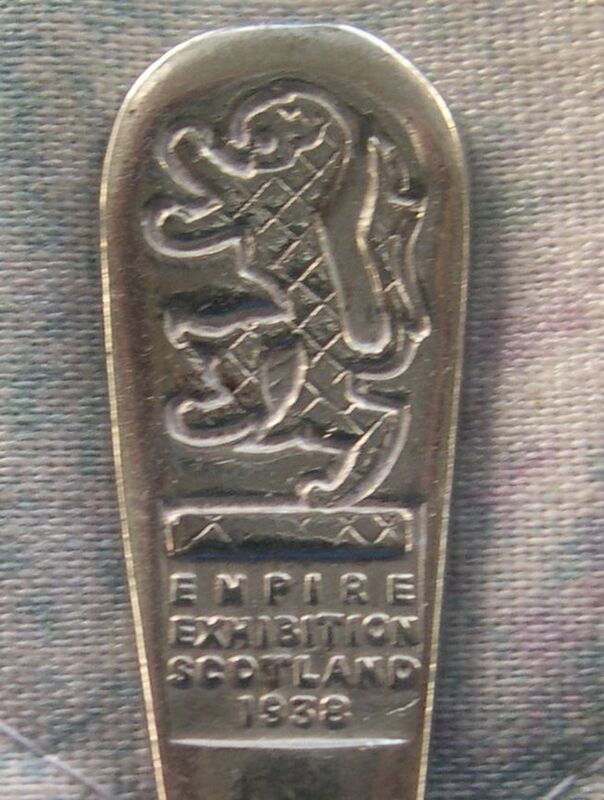 I have a very unusual spoon which I believe dates to this exhibition. If you would like to see it click Queen Victoria. Many other world fair spoons and other types of souvenirs are avidly collected.